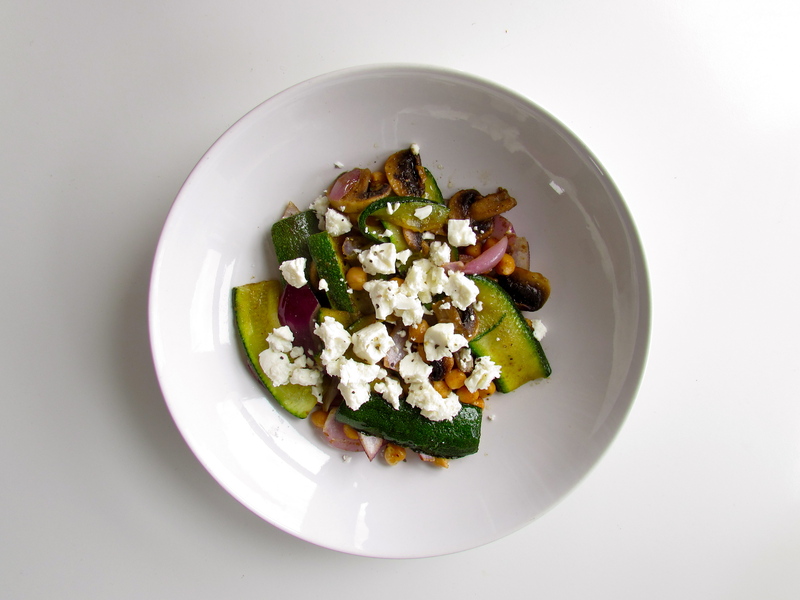 Cooked courgette ribbons, soft and succulent mushrooms, firm and filling chickpeas, and crunchy red onion make a tasty and healthy base for this warm salad. Cooked with a touch of cumin and topped with crumbly feta cheese, this dish makes a perfect light lunch. And, you can have it on the table within 15 minutes. This salad is a bit of a melting pot of cuisines. It came about from bits and bobs I had left in the fridge and cupboard. Courgettes and mushrooms are two of my favourite vegetables. Their flavours are subtle yet satisfying and they’re incredibly versatile. They can be used in everything from curries to salads, on top of pizzas or in dips. They work well in this salad as they are soft and juicy. The chickpeas and cumin bring exotic, Middle Eastern flavours and the richness of the feta cheese finishes the dish off delightfully. 1. Put a large frying pan on a medium to high heat and pour in the sunflower oil. 2. Add the mushrooms and courgette and fry for two to three minutes. Mix in the onion and fry for another couple of minutes, until the onion begins to soften (but not too much; it’s better with a bit of bite). 3. Pour in the chickpeas and scatter over the cumin. Cook for another three to five minutes, stirring throughout. 4. Serve the mixture in a pasta bowl or on a plate. Crumble over the feta and season well.